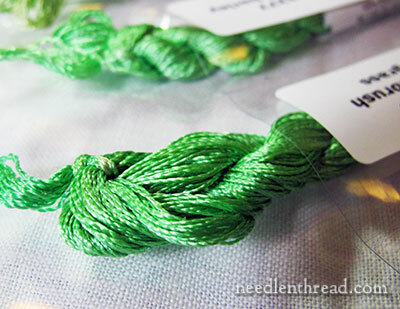 If you were the type of person to daydream about embroidery thread, what type of thread would you dream about? I can dream about silk embroidery threads all day long, if I let myself. Today, I’m going to let myself. But I am going to think about silk. I’m going to sort silk. Test silk. Touch silk. Group it, organize it, mix it up again. And I might even dabble with some preliminary stitches with silk threads. My goal today is to make decisions about silk, and so – poor me – to do that, I have to surround myself with silk embroidery threads. I know. It’s such a tough way to spend the day. One type of silk thread that I’ll be concentrating some effort on is from The Silk Mill. I’ve written about The Silk Mill threads before. Considering my current needs (for the silk version of the Secret Garden project), The Silk Mill offers something rather unique when it comes to silk embroidery thread. 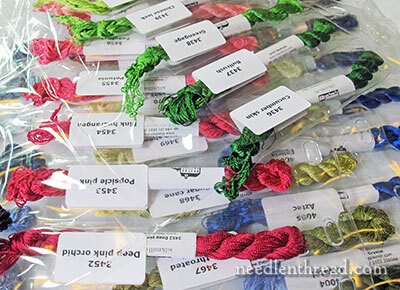 It offers a line of 600 (and soon to be 650) shades of filament silk embroidery thread. That’s a lot of color choice! The Silk Mill has a nice range of vibrant blues and greens. It also has a great range of brilliant turquoise-y blues. It has a wonderful range of reds and corals and pinks. And of violets, and oranges, and yellows. With 600+ shades to choose from, obviously, it has a good range of pretty much all the colors. There are so many silk threads that I love! My favorites have always been Au Ver a Soie’s silks – they’re such high quality embroidery threads. And Soie d’Alger (a spun silk) comes in an extensive color range. 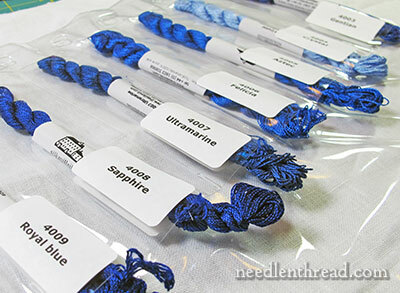 But when looking for a finer filament silk embroidery thread with a soft twist (Soie de Paris would be the Au Ver a Soie thread that fits in this category), I think The Silk Mill has the best options for color selection. Chances are, on the silk version of the Secret Garden project, I’ll be working with a couple different types of silk. I have a completely different approach in mind for the silk version of the project, and to work it out, I’m giving myself plenty of latitude for choosing threads. For those who wish to follow the silk version, I’ll be publishing updates on thread choices as I work it out on the project. The stitching on that won’t start for a little while yet. The decisions I make on threads and stitching approach for the silk 201 version of the Secret Garden project may differ from the decisions you would make. If you’re following along with the cotton version of the Secret Garden and like the look of it already, but you want to work with silk and you’re eager to start stitching, you might consider working the same techniques I’m using in the cotton version, only with your favorite silk threads. And now, I’m off to face that arduous task of tinkering with silk threads all the day long. I don’t know if I’ll survive it. But if I do, I’ll see you Monday morning! What a beautiful threads. I wish I could have all. Like you I love silk and my favourite is Soie D’Alger which I can easily buy in the UK which makes a change and I’m so glad to hear that the Silk Mill is in the UK. I am definitely going to try this silk on my next project as the 650 colours are readily available in the UK and reasonably priced. I really like their silk sets consisting of different but matching colours. Thanks so much for reviewing the Silk Mill threads and sharing your views on them with us. And yes, I rise on a Sunday afternoon in the sunny south of France. In fact, the company is the silk mill English priori, it charges in sterling but its registration is France, the production of tangles is where?. It’s a real mystery this company, but their skeins are very beautiful, thank you Mary for us to discover new companies and I let myself be tempted by their pack of autumn colors. Hi, Thomas – the monetary unit is pounds sterling, but they’re actually located in France, just so you know! Two very helpful articles on the Silk Mill threads. Quick question for you. Do you suppose that if I steamed the threads a bit more than you did, that I could straighten them further for use in flat silk eighteenth-century style embroidery? Also, if you’ve ever done trim work, do you suppose they could be used in a fringe? Asking because am starting up another silk+silk chenille embroidery project. Last time I used Soie Ovale, but bought some DeVere flat silk from the UK to try. Now this might be a third option…if the silk will untwist and go flat. The individual strands seem the perfect size for what am envisioning (see some of the coarser embroider on the waistcoats from the Snowshill Collection, UK, at http://historicalcostume.wordpress.com/2013/07/29/incroyables/). Of course you’re right. :} I wasn’t reading properly, being so excited about another reeled silk being available. So far, looks like it’s DeVere silk as the winner…just too bad they don’t have the wonderful color range. Thank you and Monday it is then. Hi everyone, I have a very stupid and somewhat embarrassing question. Who sells the least expensive silk thread? I would like to follow you, Mary, when you start the silk Secret Garden project, because I didn’t get my book in time to do much with it on the first one, (again, the cost wasn’t high but I have to budget everything!! I’m disabled, nuff said.) so I want to try the silk if I can afford to. I love your sense of humor, Mary. And, I’ve noticed from some of the other comments that many embroiderers have that good sense of humor, too.